We had the best shower on Friday! I don't have too many pictures, but what I have is posted at delanty.shutterfly.com. It was so much fun and we got all kinds of great things. We got the car seat and stroller from both moms, the swing from Kim and Aimee, the exersaucer thing from Lynn, Karen and Megan and lots of other great stuff that we will eventually learn how to use! It was great to see everyone and so exciting. It makes it all the more real that this little one is coming - ready or not! Thanks to everyone that made this all happen! We are very lucky and have a very lucky baby to be so loved before we even know him/her! Most of you already know this, but I am an extreme photo-aholic. Especially after my loving husband gave me a new Digital SLR for my bday, I have been out of control. If you'd like to check out some pictures from recent events, you can visit my collection at: delanty.shutterfly.com. Bookmark it, add comments and check back often as it changes regularly! I couldn't resist posting this pic of baby d's future best bud or betrothed. 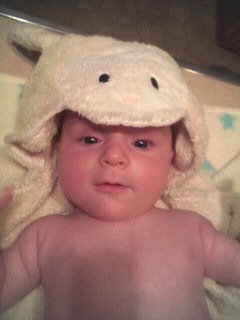 This is Matthew after bath time recently. We're (when I say we - I mean me, but they baby would be excited if she knew how many people would be there for her and how many great things she would get) super excited today since tomorrow is the big shower! Yes, I said she, but don't read into it too much-tomorrow I'll say he! :) Just depends on the day and I like he or she better than "it"! The shower is at Allison's house tomorrow night and is being thrown by all the cousins - Allison, Steph and Kristi. It will be a great time. I'll post lots of pics of the lovely event this weekend. It's getting excited that there are showers and classes - won't be too much longer now. Okay, can you tell I have a lot of time on my hands tonight? I should be working, but I'm obsessed with my new bbblog. Maybe I'll start a new business - bbblogs.com (babyblogs... get it?). This is our 20 week ultrasound. Think you can tell from this whether we have a little eej or tpd? The poll will be coming soon! I'm on my way - get in on the guessing! 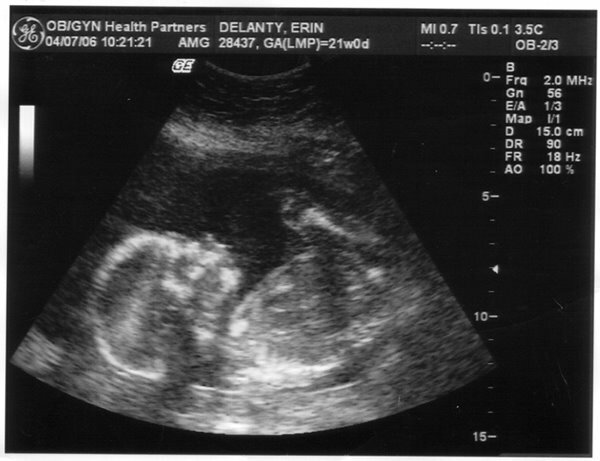 Welcome to Baby Delanty's Blog. In no time at all, this will be a forum for pictures, comments and updates. For the meantime, this will be the place to come to participate in the baby pool and keep informed on any big baby events with us! We want to know whether you think we're having a boy (Ryan or TPD, Jr.) or a girl (Ryan again or ??) and when the little bundle will arrive. I'll post pics and updates as often as I can moving closer to the due date. Thanks for stopping by and don't hesitate to leave a comment or two or ten!